Cervical cancer is one of the most common malignant tumors of the female reproductive tract. It is the second most common cause of female cancer mortality. Cervical cancer is preventable and generally curable if detected early. However, conventional screening tests have a limited ability to provide an accurate diagnosis or progression of cervical cancer. Even with the best available treatment options, a significant proportion of patients experience recurrence and eventually die. Thus, understanding of the molecular mechanisms underlying carcinogenesis in the cervix and identification of novel biomarkers are essential for the early detection and treatment of cervical cancer. MicroRNAs (miRNAs) are short, single-stranded RNA molecules that act as posttranscriptional regulators by binding to complementary sequences on target messenger RNA transcripts. It has been demonstrated that miRNAs are aberrantly expressed in various types of malignancies including cervical cancer and function either as oncogenes or tumor suppressors. Therefore, miRNAs have the potential to serve as promising markers in the diagnosis, prognosis and personalized targeted therapies. Although a number of miRNAs have been identified in predicting the clinical outcome in cervical cancer, the expression of miR-146a in cervical squamous cell carcinoma (SCC-Cx) and its role in prognosis is not fully established. BioGenex has developed proprietary Super Sensitive Nucleic Acid (SSNA) miRNA probes that enhance signals from intrinsically low populated miRNAs. The SSNA oligos are synthesized using specially designed bases to give super high melting temperatures. The high melting temperatures enable stringent washes at elevated temperatures to remove non-specific binding. BioGenex miRNA probes are dual-end labeled on 3’ and 5’ with five FAM molecules that amplify the signal, giving intense stains. The high-density fluorophore-labeled SSNA probes combined with the BioGenex Super Sensitive ™ Detection System aid in studying the lowly expressed miRNA populations and miRNA expression profiles to assess the physiological function of miRNA. BioGenex is pleased to launch a Super Sensitive Nucleic Acid miRNA ISH (SSNA miRNA ISH) probe and automated systems for analyzing the miRNA expression profile in patients with SCC-Cx. Molecular differentiation using the miRNA probe has demonstrated promising results in identifying the expression level of cell-specific miRNAs that can be used as a potential biomarker for differentiation of moderate and poorly differentiated SCC-Cx. 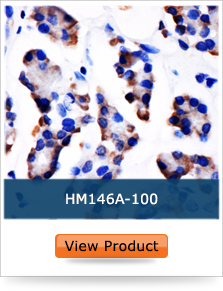 The expression level of miR-146a was evaluated in SCC-Cx and normal cervix biopsies on tissue microarray (TMA) samples. BioGenex miRNA ISH probe demonstrated significant upregulation of miR-146a in cervical cancer tissues as compared with normal tissues, with a trend towards increased expression in moderate to poorly differentiated cases. miR-146a may be used as a biomarker for the molecular diagnosis of cervical cancer. Differentiation of moderate and poorly differentiated cervical squamous cell cancer.